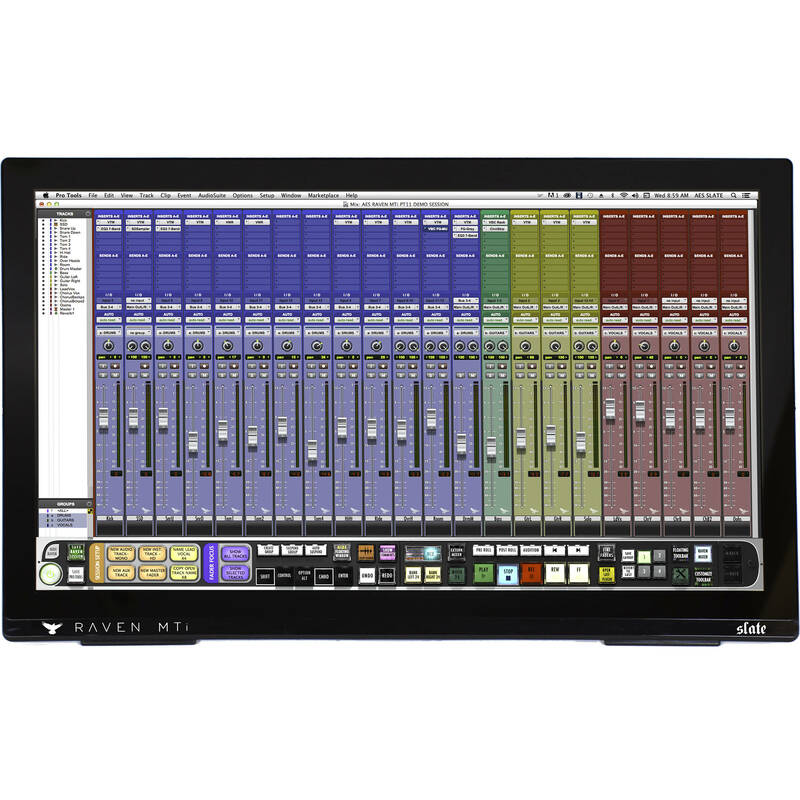 The Slate Digital RAVEN MTI2 marries the tactile control of yesterday’s mixing consoles with the convenience of today’s tablet technology. With the RAVEN, nevermore do you have to rely on your mouse for controlling your DAW. Instead, the RAVEN provides a tablet-like control-surface that can raise and lower faders, facilitate touch-control over plug-ins, operate all the buttons of a traditional transport, and more. The MTI2 represents the current iteration of RAVEN technology, putting it all in a 27” screen that supports multi-touch, gestural control. The screen sits on an included stand that is angle-adjustable. With the MTI2, you can control many faders at once, manipulate pans and sends, and set up recording sessions quickly and efficiently. The latter function achieves its expediency by means of the Batch Command System, which can execute a whole series of key commands with the press of one virtual button. By default, 100s of presets are included for most major DAWs. However, you can program your own custom commands yourself, housing up to 1000 functions in one command. The RAVEN MTI2 interfaces with most computers and most DAWs, though for a list of general compatibilities, please see the specification section. Connections can be made to your computer by means of a standard HDMI cable (available separately) and a USB 2.0 connection. An iLok 2 dongle—also available separately—is required for operating the Raven. FADERS 3.0 provides multi-touch virtual faders that allow precise control of your DAW's faders. By integrating multi-touch 100mm virtual faders directly into each DAW, you now have control over mix levels and automation over more than one track at a time. The FADERS 3.0 algorithm offers a naturalistic control over your faders—control that is both comfortable and fun to implement. A FINE FADER mode is on hand, which can quadruple the resolution of the faders to facilitate especially miniscule moves. RAVEN control software now carries a technology called GESTURES, which facilitates classic, multi-touch gestures to control important elements of your DAW. Opening and closing plug-ins, muting and unmuting tracks, zooming in and out—all of this and more can be accomplished with familiar gestures. In Toolbar mode, your DAW controls are more accessible, laid out right in front of you. You'll notice Transport, Edit/Mix window selector, and convenient tools for tracking such as Record Looping, Click, Create Group, and Undo. Use intuitive multi-touch gestures on the RAVEN NAVPAD to perform Scrub/Shuttle, Waveform Zoom, Track Zoom, and Track Banking, and RAVEN Batch Commands. Because the RAVEN Toolbar is virtual, it's user-customizable, so you can put the controls you want where you want them. The Batch Command System is a series of preset and customizable buttons that can execute up to 1,000 key commands and mouse clicks automatically. With just one button, the Batch Command System allows you to create instant headphone sends, to name tracks, to put entire drum tracks on the grid, to export stems, and more. The Batch Command System comes pre-programmed with 100 preset batch commands in every supported DAW, with layouts for Music, Mastering, Post Production and more. Record your own mouse click automation or program user commands with QUICKLIST, which features hundreds of predefined DAW operations. Just touch and hold on a Batch Command button to edit, and you'll have access to almost limitless possibilities. Slate Remote expands your workflow to your iOS-compatible. Slate Remote is a free app for iOS users and available at the app store to anyone with a RAVEN. Slate Remote automatically synchronizes with your RAVEN session via Wi-Fi and gives you access to your custom Batch Commands, allowing it to remotely perform time-saving tasks for you from the palm of your hand. RAVEN hardware comes with your choice of one supported DAW. Additional DAW support licenses can be purchased for a nominal fee. Box Dimensions (LxWxH) 29.0 x 20.4 x 5.8"